These General Terms and Conditions of Sale (“Terms and Conditions”) shall apply to the sale by Macron Dynamics, Inc. (“Macron”) of all products and services to the purchaser of the same (“Customer”). Prices and Invoicing Prices for products and services shall be set forth on the applicable invoice and, unless otherwise noted, are exclusive of shipping charges, and of any applicable value – added sales, use, excise, transfer, transport or other tax, tariff or duty of any sort imposed by any government authority (“Taxes”). Customer is solely responsible for all Taxes payable in connection with the provision of products or services to Customer. Invoices will include any Taxes and additional costs incurred by Macron on behalf of Customer. At its discretion, Macron may require a deposit of a percentage of the purchase price, or prepayment in full, prior to provision of product or services. Macron reserves the right to correct any invoice for errors or omissions. deduction, within thirty (30) calendar days from invoice date. If an invoice is not timely paid, Customer shall be deemed to have waived all warranties, relating to the products and services covered thereby, and Macron may stop fulfillment of any other orders of Customer. Macron may charge interest at a rate equal to or less than the maximum rate permitted by applicable law on any past due invoice balance, beginning on the first day after the due date of the invoice. Shipping/EXW(“ex works”Incoterms) All shipments originate from Croydon, PA and are packaged according to standard packaging practices. MACRON DYNAMICS, INC is not responsible for material damaged in transit. Responsibility lies with the carrier. In the event equipment is received in a damaged condition, the customer must make claim to the carrier as well as contacting MACRON DYNAMICS, INC within three working days. When appropriate, we will render all possible assistance to ensure a satisfactory adjustment of the claim. Carriers are selected based on customer requirements. If a specific carrier is not suggested, we will ship in the most feasible manner. EXW is from our factory facility at Croydon, PA, 19021. Acceptance by Customer Customer shall inspect product within ten (10) calendar days after delivery. Products will conclusively be deemed accepted by Customer, unless Customer provides Macron with written notice providing an explanation for the basis of rejecting the product within such ten (10) – day period. If Macron reasonably deems the rejection justified, Macron, at its option, either shall repair or replace the rejected product. The party initiating shipment shall bear the risk of loss or damage to the rejected product in transit. If Macron reasonably determines that the rejection was improper, Customer will be responsible for all resultant costs and expenses incurred by Macron. Return Policy Orders may not be cancelled or modified after delivery, and product may not be returned after acceptance without Macron’s written authorization. To request such authorization, Customer must supply in writing the sales invoice number, name of product(s), quantity, condition, and reason for return (including a brief description of any claimed defect). If return is authorized, Customer will be provided with a Return Material Authorization Number, which must be included in the returned product packing slip and clearly marked on the exterior of the return shipping container. All returned product is subject to inspection and acceptance by Macron within ten (10) calendar days of receipt, must be unused and in saleable condition, and must be returned in the original packaging with all accompanying documentation intact. Specially ordered products may not be returned. Warranty Macron Dynamics products are subject to a 1 (one) year (from date of shipment) Limited Warranty for defects in material or workmanship. Macron will repair or replace, without charge, f.o.b. shipping point, any parts proven to Macron’s satisfaction and upon Macron’s examination to have been defective in material or workmanship when furnished to the original purchaser. In addition, deterioration or wear caused by abuse, maintenance neglect, severe eccentric loading, overloading, chemical or abrasive action, or excessive heat shall not constitute defects. Equipment and accessories not of Macron’s manufacture are warranted only to the extent that they are warranted by the manufacturers, and this warranty is applicable only if the defect was the result of normal use, application and service, and is void if the product or any part hereof was tampered with, repaired or altered by any person other than the factory or authorized repair station. Exclusive Warranty and Remedy THE EXCLUSIVE WARRANTY OF MACRON IS THE WARRANTY STATED ABOVE IN SECTION 6. IN THE EVENT THIS WARRANTY IS BREACHED, THE SOLE OBLIGATION OF MACRON, AND THE EXCLUSIVE REMEDY OF CUSTOMER, SHALL BE TO HAVE ALL REASONABLE ADJUSTMENTS, REPAIRS AND REPLACEMENTS NECESSARY TO CORRECT ANY SUCH DEFECT MADE AT THE SOLE COST AND EXPENSE OF MACRON, SUBJECT TO THE LIMITATION SPECIFIED IN SECTION 8 BELOW. MACRON MAKES NO OTHER EXPRESS OR IMPLIED WARRANTIES CONCERNING ANY PRODUCTS, SERVICES OR ANY OTHER ITEMS PROVIDED TO CUSTOMER. MACRON HEREBY DISCLAIMS ANY IMPLIED WARRANTY OF MERCHANTABILITY, WARRANTY FOR FITNESS FOR A PARTICULAR PURPOSE, OR ANY OTHER WARRANTIES NOT OTHERWISE SPECIFICALLY SET FORTH HEREIN. Limitation of Liability IN NO EVENT SHALL MACRON BE LIABLE IN CONTRACT, TORT OR OTHERWISE FOR INCIDENTAL, CONSEQUENTIAL, SPECIAL, EXEMPLARY, INDIRECT OR PUNITIVE DAMAGES, INCLUDING, WITHOUT LIMITATION, LOSS OF BUSINESS, LOST PROFITS OR DAMAGE OR DESTRUCTION OF DATA, EVEN IF MACRON HAS BEEN ADVISED OF THE POSSIBILITY OF THE SAME. THE MAXIMUM LIABILITY OF MACRON TO CUSTOMER SHALL BE LIMITED IN ALL EVENTS TO THE REASONABLE COSTS OF ADJUSTMENTS, REPAIRS OR REPLACEMENTS NECESSARY TO CORRECT DEFECTS IN THE PRODUCTS COVERED BY THE WARRANTY STATED IN SECTION 6 ABOVE, OR CAUSED SOLELY BY THE NEGLIGENCE OF MACRON, SUBJECT TO A MAXIMUM AGGREGATE LIABILITY OF THE AMOUNT ACTUALLY PAID BY CUSTOMER FOR SUCH PRODUCTS. CUSTOMER AGREES TO PROVIDE MACRON WITH PROMPT WRITTEN NOTIFICATION AS TO THE SPECIFICS OF ANY CLAIM FOR DAMAGES AND TO PROVIDE MACRON WITH A REASONABLE OPPORTUNITY TO INVESTIGATE SUCH CLAIM. Warning MACRON ACTUATORS ARE INTENDED FOR INDUSTRIAL USE ONLY AND SHOULD NOT BE USED TO LIFT, SUPPORT, OR OTHERWISE TRANSPORT HUMAN CARGO, UNLESS MACRON PROVIDES A WRITTEN STATEMENT THAT THE ACTUATOR UNIT AS USED IN THE PARTICULAR APPLICATION IS SUITABLE FOR LIFTING HUMAN CARGO. Force Majeure Macron shall not be liable for any delay or failure to perform its obligations hereunder due to any strikes, lockouts, secondary boycotts, labor organization stoppages and harassments, damages caused by fire, lightning, earthquake, other natural disasters, or other casualty, and any other conditions beyond the control of Macron. Indemnification Customer agrees to indemnify and hold Macron, and its employees, officers, directors, shareholders, agents and representatives (collectively, Indemnitees”) harmless from and against any loss, claim, demand, liability, damage, suit, cost or expense, including attorneys’ fees, suffered or incurred by Indemnitees in connection with (a) any action or omission of Customer, its employees, officers, directors, shareholders, agents and representatives, relating to the products and services being sold by Macron to Customer, (b) the falsity of or omission in any matter represented, warranted or certified by Customer to Macron, or (c) the nonfulfillment by Customer of any covenant, obligation oragreement of Customer to be performed under these Terms and Conditions or any agreement between Customer and Macron. Arbitration Any controversy or claim arising out of or relating to the warranty stated in Section 6 above, its interpretation, or any breach thereof, which cannot be amicably resolved between Macron and Customer within sixty (60) days of written notice by the aggrieved party to the other, shall be finally settled by binding arbitration submitted to the three (3) arbitrators selected from the panels of the arbitrators of the American Arbitration Association in accordance with the rules and regulations of the American Arbitration Association sitting in Philadelphia, Pennsylvania, with each party to pay its own cost. Modification These are the entire Terms and Conditions. All communications between the parties, either verbal or written, not contained herein are hereby withdrawn and annulled. These Terms and Conditions may not be changed or modified except by an agreement in writing by Macron and the Customer. Severability Provisions If any provision of these Terms and Conditions shall be declared void or invalid by a court of competent jurisdiction, such void or invalid provision shall not in any way impair the whole Terms and Conditions, but the remaining provisions shall be construed as if not containing the provision or provisions held to be void or invalid, and the rights and obligations of the parties shall be construed and enforced accordingly. Governing Law These Terms and Conditions shall be deemed to have been entered into in Bucks County, Pennsylvania and shall be construed and enforced in accordance with the laws of the Commonwealth of Pennsylvania. Customer hereby consents to venue in the Court of Common Pleas of Bucks County, Pennsylvania. ALL OBLIGATIONS OF MACRON RELATING TO ANY TRANSACTION WITH CUSTOMER IS EXPRESSLY CONDITIONED ON CUSTOMER’S AGREEMENT TO ALL OF THE ABOVE TERMS AND CONDITIONS. How do you measure the 7 days? We measure the 7 days as “business days” excluding weekends and Holidays. When does “the clock start & stop ticking”? The day Macron receives a valid Purchase Order from our Distributors or in special cases, directly from the end user, starts the clock and it stops the day we ship the order. What is a valid Purchase Order? The MSA part number and associated accessories are configured properly and are part of the “Ships Fast” Program [look for the “Ships Fast” icon]. Most importantly, the Motor manufacturer and model number to be used must be indicated on the PO [catalog cut sheet is acceptable as long as required information is clearly marked]. Any errors will delay the shipment and void the “Ships Fast” offer. Packaging is included. Shipping charges are pre-pay and add, EXW Croydon, PA 19021. Carrier depends on customer preference or best way as determined by Macron Traffic department. Some actuators requested will be quite long and will generally exceed UPS & FedEx weight and girth limitations, in these cases a common carrier will be used. Can I order more than one “Ships Fast” actuator? Yes, any volume up to 10 units may be ordered on any one Purchase Order. We enter the Distributor order that was placed for your actuator. We launch our work orders for actuator build & motor adaptor plate machining to match your motor selection. We assemble actuator and any accessories ordered [gearboxes, sensor kits]. We inspect, package and ship the product. Why do we think this is Industry leading? 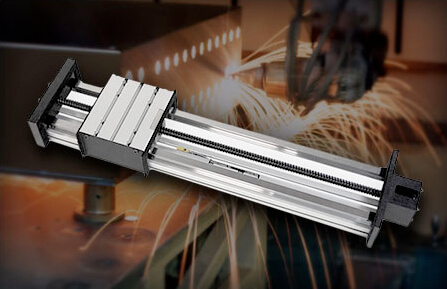 Our survey of Distributors indicates that no belt driven Linear actuator manufacturer offers the configuration flexibility across a broad product style up to a nominal 6 meters length in 7 days as Macron can with a gearbox and sensors.